St. Mary’s Church, Beverley, has received initial support* from the Heritage Lottery Fund (HLF) for the Medieval Curious Carvings project, it was announced today. Made possible by National Lottery players, the project aims to repair and conserve a vulnerable area of the church in which a number of ‘curious carvings’ are housed within the ceiling. These 14th century Bosses are unique and this project will endeavour to make this beautiful heritage accessible for all to learn about and enjoy. Development funding of £38,600 has also been awarded to help St Mary’s progress their plans to apply for a full grant at a later date. The project aims to carry out essential conservation work to repair the stonework and prevent water damage to the ceilings, digitally record the extraordinary carved bosses and develop a wide range of creative activities and events allowing on-line public access to the collection for the first time. An educational programme is also planned for adults and children which we hope to start to roll out in 2019. Volunteers will be given training so they can learn new skills, support the activities and help visitors engage with the church’s wonderful art and history. St Mary’s is widely regarded as a national treasure of architecture and heritage and is home to Lewis Carol’s White Rabbit as well as having extraordinary carved and painted ceilings. It is also the focal point of much community activity in Beverley and attracts tens of thousands of visitors from all over the world every year. St Mary’s Church has long been acknowledged to be one of the finest examples of a late medieval church in England. Its beauty and artistry mark it out as one of the great parish churches of England and a masterpiece of Gothic art. The lightness of the building alongside the extraordinary and detailed and intricate carving combined with the vivid colours of the painted ceilings make St Mary’s Church a joy to visit. St Mary’s is perhaps best known for its beautifully painted ceiling depicting not only a map of the heavens above but also the Kings of England dating from 1445. The artistry and colour of these painted ceilings including the 625 painted bosses continue to delight visitors and tourists alike. Almost equally well known are the carved pillars. One of the most famous of these is The Minstrel Pillar, one of fully 34 musical themed carvings in the church. The Minstrel Pillar shows five carved and richly painted figures of musicians standing atop the column capital. Another famous carving is found at the entrance to St Michael’s Chapel, where one of the pillars is decorated with a wonderful carving of a rabbit dressed as a pilgrim. The rabbit carving dates to about 1330 and is thought to be the inspiration for Lewis Carroll‘s White Rabbit in ‘Alice in Wonderland’. The choir stalls date to 1445 and feature 28 beautifully carved misericords. These include one of a Green Man, another of a fox representing a friar and another depicting an elephant. There is also a scene of bear baiting, a boar hunt, and a wild man each depicting a story of medieval life. Throughout the building, the stonework tells extraordinary tales of lives gone by from the intricacies of the mason’s marks to the memorial to a pair of Danish soldiers which tells the tragic tale murder and revenge of the Danish Soldiers brought to England by William of Orange. St Mary’s is an extraordinary church which hosts a lively and vibrant community. * HLF Heritage Grant applications are assessed in two rounds. St Mary’s ‘Curious Carvings’ project has initially been granted round one development funding of £38,600 by the Heritage Lottery Fund, allowing it to progress with its plans. Detailed proposals are then considered by HLF at second round, where a final decision is made on the full funding award of £421,400. 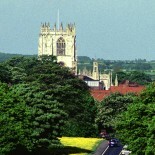 Director of Development at St Mary's Church Beverley. This entry was posted on September 25, 2015 by rolanddeller in Uncategorized.